THE BEST PROMOTIONAL GIFT YOU WILL EVER GIVE Give them something they will use every day of their professional life. 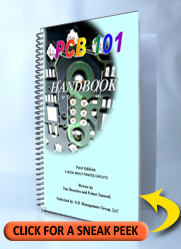 The all new PCB 101 Handbook is the perfect promotional item for you to give to your customers. This is a gift that will actually educate your customers; making them smarter and better informed in the printed circuit board business. Consider that new buyer, that new quality employee, your new salesperson... or any other non-technical member of our industry who would benefit by having a copy of this little handbook. Written in simple clear laymaen’s language, this book is designed for those non-technical persons who need to know about printed circuit boards on a more basic level. As a great added feature, if you buy in quantity we can customize* the book to make it yours. We will develop an ad for you on the back cover of the book; we can even insert pages of text highlighting your particular forte and change the front cover so that your company will always be associated with this gift. “What a fantastic book! There is a tremendous amount of good information in a small package. Anything from basic Fabrication process’ to the unique variables associated with more complex process’. You’ve got it all here. This book gets into the background on the state of PCB technology from the past and as it exists today. Dan Beaulieu speaks about STRATEGIES for success in today’s market while industry guru Bob Tarzwell walks you through board fabrication from mechanical drilling and dry film type imaging to laser drilling and stacked vias with extremely thin dielectrics. There is even a Glossary with definitions of terms and an Engineering Data page with a list of Notations and their meanings. Sections on Specifications and Design are well written and concise. This is a “must have” for anyone starting out in the business, Electrical Engineers, as well as non-technical salespeople. I see the PCB 101 Handbook as being very useful for buyers, quality people or anyone who needs to know how to build a circuit board. Companies that use circuit boards, such as EMS, OEs, Designers and new product developers, will find this book extremely valuable as well. Even financial people and those involved in mergers and acquisitions of printed circuit board companies should make sure that this little handbook is part of their personal reference library. Finally, I personally plan to use this book for training not only new employees in our shop but those people who have been here a while as well. I feel that the better informed our associates are about our industry and technology the more understanding they will have and the better they will perform. Although this is a relatively small book, there is more packed into these 94 pages than in many books ten times its size!" Mark Thompson - CID, Prototron Circuits, Inc.
*Free customization available (100 min order.) Highlight your company on the front and back covers. Extra charges apply for customization of inside pages. Half of total payment will be required in advance on all custom orders. Contact Dan Beaulieu at 207-649-0879 or danbbeaulieu@aol.com to place custom orders.